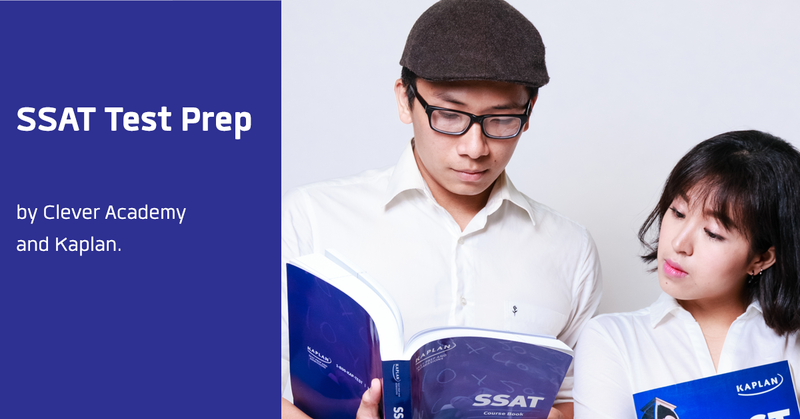 Your child’s SSAT score serves as an important factor in the admissions process at select, competitive middle and high schools in the United States. Explore our options and get started today, and your child can score higher on the SSAT. Clever Academy and Kaplan can show you how. The Secondary School Admission Test (SSAT) is developed and administered by the Secondary School Admission Test Board (SSATB). The exam was designed as an aptitude test to measure a student’s ability in core subject areas independent of a student’s school record. Clever Academy & Kaplan's program is designed and delivered around your child's unique needs, learning style, and score goals! Out-of-Class Resources: comprehensive SSAT course book. **PT: Placement Test – students are required to take our Placement Test before any course enrollments. Our Placement Test is taken free of charge and you are required to book the appointment by phone, email or at Clever Academy campuses. Students interested in attending private boarding schools, or independent secondary schools in the U.S., will need to take the SSAT. Admission officers will use SSAT score to judge the current and potential ability of the students to handle their school curriculum.